The man, the myth, the legend … and Game of The Week! The 2008 season of the US Chess League started at the end of August, and the SF Mechanics got off to a good start by beating the defending champion Dallas Destiny 2.5-1.5. GM-elect Josh Friedel posted a writeup on the team blog. In week 2, we faced the expansion Chicago Blaze and the match ended in a 2-2 tie. I was on board 2, behind Josh, against IM Emory Tate. The legendary Emory Tate. If you’re following an American tournament on ICC, or even some international tournaments, it’s hard to escape mention of 3 chessplayers: Fischer, Nakamura, and Tate. Here are a couple writeups I found, at the Chessdrum: a brief intro and part 2. A surprise, but as I hadn’t done much preparation for this game, it didn’t bother me too much. 2. e4 e6 3. Nd2!? Clearly not the most testing move, but I was a bit tired before the game, and I wasn’t going to challenge him in what might be considered the main lines with either 3.c4 Bb7 4.Nc3 Bb4 or 3.Nc3 Bb7 4.Nf3 Bb4. The latter is probably White’s best option of punishing Black for his ultra-hypermodern play in the opening, but I simply couldn’t be bothered to do that this early in the game. We’ve essentially reached a funky version of the Advance French where Black is hoping to exchange off the light squared bishops. To this end, he needs to take away the option of Qa4+ (as after 6…Ba6 7.Bxa6 Nxa6, 8.Qa4+ wins a piece). Developing the bishop on f1 is natural now, but doesn’t help White’s cause as after 7…Ba6, he’ll have nothing better than to exchange bishops. Thus, I was looking for something useful to do, and realizing my advantage was going to be on the kingside, I decided to start seizing space immediately. 7. h4! Ba6 8. Bxa6 Nxa6 9. Qe2 c4!? A tough decision for Black. If he retreats with 9…Nb8, he maintains the central tension for a bit more time, but he also loses time with his knight. I was planning 10.h5 Nbc6 11.a3, taking away the b4-square. White can then proceed in a few different ways on the kingside, most probably with h5-h6 (as in the game) or h5 and Rh4-f4, to pressure the weak f7-pawn. Either way, I think White still is a bit better. Ramming the pawn into Black’s camp. If he pushes past with 11…g6, he’s left with huge dark-square weaknesses (and a knight coming to g4 would be especially strong then), while if he lets White take on g7, the bishop on g7 is going to be weak, while the f6-square is still soft. During the game, I thought it made sense to go after the kingside immediately, but maybe it would’ve been more prudent to play 12.a3. That would take a move out to slow down Black’s queenside counterplay, as in the game, he stirred up some trouble there. White can afford to do this given that he’ll win the kingside battle anyways. I considered this during the game, but I thought I would actually be able to use the open b-file faster than Black. With that in mind, I doggedly pursued my strategy on the kingside. 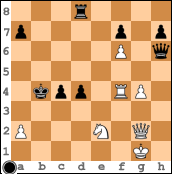 This was where I was hoping to make real use of the b-file by playing 17.Rb7!?. Black can’t leave the rook on the 7th in his camp, and so he must play 17…Qc6 (17…Rb8 and 17…0-0-0 both kick the rook away from b7, but allow White to take the pawn on a7). I then had planned 18.Qb2, taking the b-file and on 18…Ba3, White has 19.Qxa3 Qxb7 20.Qd6, when White is winning due to the threat of Nf6#. Fortunately, while he was thinking, I realized he could play 18…Kd8!! there, with the simple idea of 19…Kc8. All of a sudden, my “control” of the b-file just gets me into serious trouble. 17…Nc7 18. Nh2 Nb5 19. Qf3 O-O-O 20. O-O Rd7 21. Ng4 Nh4 22. Qh3? Up until now, my play had been pretty logical and to the point. However, here, I missed my chance with 22.Qxf7. I was spooked by the possibility of 22…Bg5 23.Qxe6 Nc7, seemingly trapping the queen, but 24.Rb4! saves White and leaves him winning. 23.Bd2 might look more natural, as it guards the weak c3-pawn, but the bishop is exposed on d2 and will be vulnerable if Black ever puts a queen on the 2nd rank (either after …Qxa2 or …Qc2). Thus, I decided to put it on f4. (2) 23…Nxh6 24.Nxh6 Bxf6 25.exf6 Nd6 (25…Rb7? 26.Nxf7!) 26.Rb2 and White just doubles on the b-file. (3) 23…Bxf6 24.Nxf6 Rb7 25.Nxd5 Nxh6 26.Rb4! 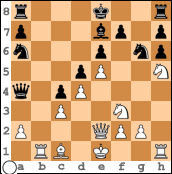 Qa5 27.Rxc4+ Kb8 28.Nb4, and the threat of 29.Nc6+ means White can take the knight on h6 later. 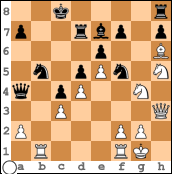 White was threatening to remove the support from under the f5-knight with 25.Nfxd5. A visually pleasing sacrifice, but it was virtually forced. 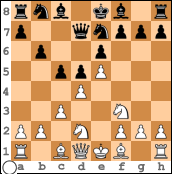 The knight had no other safe squares, and 25…Bxf6 runs into 26.gxf5! Be7 27.fxe6 fxe6 28.Qxe6+ when White is crashing through. 26. cxd4 Nxd4 27. Rxb7 Kxb7 28. Ng3 Bxf6 29. exf6 e5 30. Be3 Qc2 31. f4!? After the game, David Pruess told me this was move was insane, and I agreed. However, I didn’t like 31.Qh5 Rd7, when I can’t take on e5 because of the weak f3 square. And without that double attack, I needed to find another way to break up his central pawn phalanx. 31…Qd3 32. Bxd4 Qxd4+ 33. Kh1?! I was now down to 1 minute. The computer rightly points out that 33.Kg2 was better. I didn’t see anything clear after any of the king moves to g2, h2, or h1, but I decided against putting it on the 2nd rank because of some possible checks or pins from b2 or d2. After playing pretty well for the rest of the game, Tate started to go wrong here and got too ambitious. 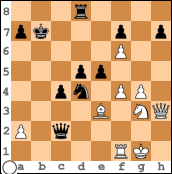 34…Qe4+ was better, as after White interposes, Black can choose to exchange queens and enter relatively drawish endgames at will. Given the match situation (where they won on board 3 and were winning on board 4), this would have been the more prudent option for the team as well. White is already better again, as the pawns are temporarily stopped and Black’s king is somewhat exposed. The ensuing king walk is somewhat counter-intuitive, but it’s hard to sit tight sometimes. 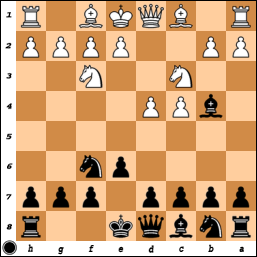 The previous king moves were not too bad, but this one starts a real downward trend for Black. What’s the king doing on b4? In time pressure, I missed that 38.Nf4! was much stronger. Black had to prevent his queen from getting shut out and so 39…Qd2 was called for. The finisher. White cuts Black’s queen off from giving any checks, opens the long diagonal for White’s queen to give a check on b7 (and as it can later check from b6 or d8, it indirectly is attacking the rook on d8 already), and eyes Black’s king along the 4th rank. White is completely winning now. White is going to deliver checkmate soon, and so Black resigned. This brought us up to 1-1 in the match, and after Josh won and Naroditsky lost, the match was finished at an even 2-2.